Det kan til tider være svært at følge med i, hvornår alle de forskellige spil til vores konsoller udkommer, så tænkte at et emne dedikeret til udgivelsesdatoer var en god idé at have på siden. Derfor poster jeg den seneste liste fra Nintendo of Europe herunder, og så kan folk give besked, hvis de ser ny information, der kan tilføjes. (Titlerne får lov at stå på listen måneden efter de er udgivet, men fjernes derefter). Senran Kagura Reflexions udkommer 13. september i USA. Der er ikke nævnt noget om den europæiske, men mon ikke det kommer snart? Didn’t fancy seven years at medical school? Skip straight to the operating table with the critically-acclaimed Surgeon Simulator CPR, fully revived and feeling better-than-ever on the Nintendo Switch™! Now featuring all-new motion control functionality as well as local co-op play, it’s time to scrub up for the most immersive version yet of the infamous operation sim! transplants in theatre, high-pressure procedures in an ambulance, and anti-gravitational operations in space! Yes, operating on the go’s never been easier thanks to the Nintendo Switch! Fully compatible with the Joy-Con controller, it’s time to take Bob the patient’s life into your own hands like never before! Play on the TV, in handheld mode, or using motion control functionality to perform life-saving operations with nail-biting precision. NEED SOMEBODY TO PLAY WITH? Got a bone to pick with your friends? With split Joy-Con support, tag a second surgeon in at any time, whether it’s at home or on the go, to immediately launch local co-op play! FEEL IT IN YOUR BONES! From hammers to hatchets, buzzsaws to laser pens, no operation’s ever the same, and thanks to built-in HD Rumble, you’ll truly experience every crunch, crack, splatter and splutter! Containing all the original heart-in-your-mouth (or wherever else you decide to put it!) operations, including the additional teeth and eye transplants from the A&E Edition, Surgeon Simulator CPR also includes the highly-classified Alien Autopsy mode, too! So what’re you waiting for, doc? A man’s life’s on the line! 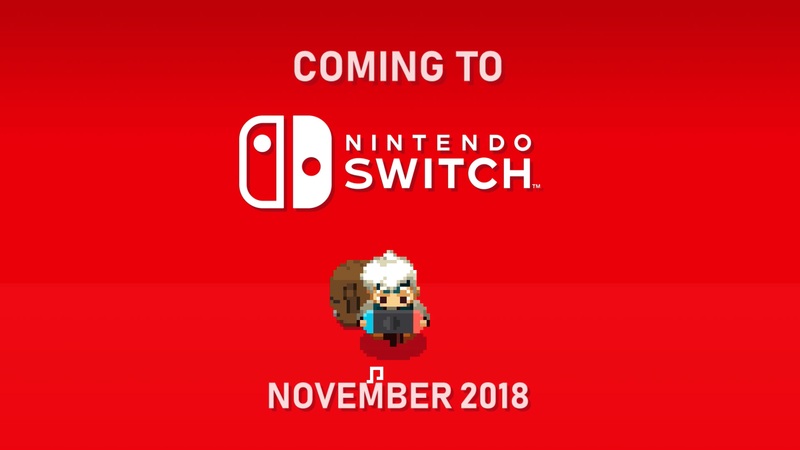 Moonlighter kommer til november har 11bit Studios meldt ud i dag. South Park: Stick of Truth udkommer 25. september. Monster Boy and the Cursed Kingdom er desværre blevet udskudt fra 6. november til 4. december pga. problemer med den fysiske version. Unfortunately the production of the physical card/disc package ran into unforeseen difficulties. This forces us to reschedule the release once again, we’re very sorry about that. It turned out that the physical goods manufacturing takes longer than initially planned and we could only choose between rushing out in time or complete the Day-1 edition properly with keeping our promises of its content. There was no question: we’re now reaching a 5 year production cycle of Monster Boy and it didn’t make sense to us to have an incomplete physical release so we decided to give the manufacturing process more time so the physical release can shine as the game itself. So much polishing, so much work – we don’t want to see a half-baked physical release. We learned about the production difficulties yesterday so you can imagine that we had a very hectic 24 hours window to look for a new release date. The next possible and also reasonable date was December 4 so we reserved that one right away. Please understand that digital and physical release are tightly linked to each other so this means the game release will take place on December 4 for both digital and physical release. Again, we’re very sorry for the short notice and we can understand that this is gut punching news for some of you but there was no other way. We also wanted to let you know as quickly as possible. Thank you for your understanding. Carcassonne til Switch udkommer 6. december. What could be more chaotic than having to run through a busy Japanese train station during rush hour with hundreds of salarymen and barriers? How about just missing the departing bullet train so you have to run on top of it and jump on a bull train mid race! Add some watermelons, classic banana peels and hurdles to that and – voila – we have ourselves a brand new Nippon Marathon track! Story Mode allows you to choose and follow the journey of the four main characters from pre-Nippon Marathon to post-Nippon Marathon in a mix of races and visual novel with numerous chapters – one of them is Snuguru Maestro! Find out about his ancestry, where his love for watermelons comes from and most importantly: how in the world is he half-human, half-dog?! Stay at the front of the pack to make your competitors disappear at the end of the screen and gain stars – then the race resets to the last checkpoint until the finish line where the racer with the most stars wins! Easy, right? Absolutely, if it weren’t for throwable fruits, shopping carts, inflatable pineapples, collapsing tracks, clingy Shiba Inus, water melon rains and many more hilarious hazards! The Walking Dead The Final Season Episode 4 udkommer 26. marts. Atelier Lulua: The Scion of Arland invites players to assume the role of Elmerulia “Lulua” Fryxel, a young aspiring alchemist training under former student turned mentor, Piana. Lulua studies diligently to fulfil her dream of becoming a great alchemist just like her mother, Rorolina Frixell; but during her training Lulua discovers a mysterious Codex, awakening an ancient power within her that enables Lulua to decrypt but a single page – with many more riddles for her to unravel. Players will be tasked with performing actions focused around the core Atelier series gameplay – Gathering, Battle, and Synthesis – to allow them to decipher more of the text, as well as learn exciting new types of alchemy. Lulua sets off to Arland in the hopes that she can improve her powers and uncover the riddles of the Codex. When arriving, she learns that her mother’s atelier shop has been forced to close. Relying on the help of the Codex, Lulua works hard to save the shop before it’s too late. The first steps into her new adventure are filled with excitement, but little does Lulua know that Arland is home to many mysteries yet to be awoken. On their journey, players will meet a compelling cast of companions, with some familiar faces joining the line-up, including: the most renowned alchemist and mother of Lulua, Rorolina Frixell; the ex-apprentice of Rorona and influential alchemist, Totooria Helmold; keen adventurer and private guardian of Totori, Mimi Houllier Von Schwarzlang; and former knight turned chief of the ‘Guardian Force’, Sterkenburg Cranach. Catan udkommer til Switch 20. juni. Der er ingen ny trailer for det eller noget, så venter lige på en sådan, før der kommer en nyhed om det. Redout - annonceret for over to år siden - har fået opdateret sin side på eShop og står til at udkomme 14. maj. Nicalis, der står for udgivelsen, bekræfter, at der er nyt om spillet meget snart. Redout is a freakishly fast and uncompromising anti-gravity racing game, designed to be as challenging and satisfying as the best games in he vertigo-soaked futuristic arcade racing genre. Each turn, slope and twist applies a unique force to your vehicle, and players can drift and pitch the ship to minimize friction, channeling those forces into even greater forward velocity. The courses combine the efficiency of low-polygon structure with the eye candy of state-of-the-art shading, lighting, and special-effects animation. The result? Breezy coastlines, eerie frozen landscapes and vast desert plains, all peppered with the flying sparks, electrical arcs and blazing exhaust of Redout racing intensity.